Google has released an update for its iOS app that adds an extension to iMessage. This allows for easy searching -- be it for GIFs or restaurant opening times -- while you chat, so there's no need to leave the app. More than this, it is also possible to share the information you find as a card. The update also brings an expansion of sharing to all web browsers, including Safari. Share a page to the Google app, and you'll see a list of related suggestions. But it doesn't end there. Google has also introduced new options for iPad users. To take advantage of the new "discover and explore" feature, you need simply share a page from your web browser using the Google app. This will automatically perform a search for similar, related content so you can find out more about a topic without having to keep conducting multiple searches. 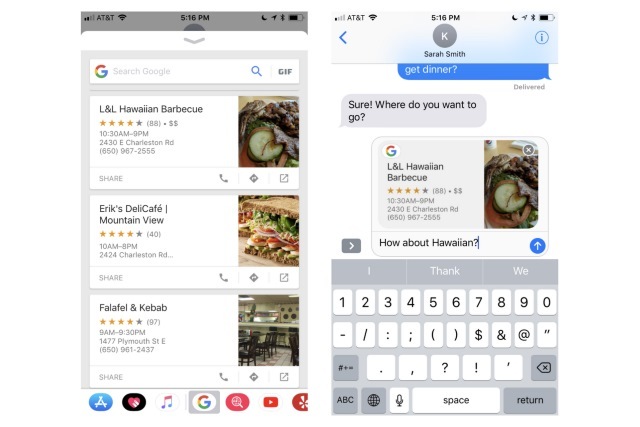 The Google app for iOS now supports an iMessage extension to help you search and share GIFs, restaurants and videos, whenever you're messaging a friend. You can tap on the icon for "Food" or "Nearby" to share your favorite locations, or perform a search and share a card directly into the conversation. Want to research a new restaurant before sharing it with friends? Just tap on the restaurant card, and we’ll take you to the Google Search page, where you can look up the busiest times, as well as menus and reviews. Switch to GIF Search mode, and you can find and share a "happy birthday" GIF. If you already have the Google app on your device, no additional installation is required. Just open iMessage, tap the iMessage apps drawer, and tap on Google app icon. At the moment, this feature is only available in the US, but it will hopefully roll out to other countries in the near future. On iOS 11, you can now drag and drop to quickly and easily move text, images and links to and from the Google app. If you’re reading a great article on the Google app, tap and hold to pick up the link and drag it into iMessage to share with a friend, or into Notes to save for later. So, now is the time to check for updates, or to head over to the App Store to download the latest version of the Google app.